When the temperature drops and the snow begins to fall, all around the world people prepare to celebrate this time of the year, with the longest nights and the coldest days. Whether it is Dongzhi in China, Inti Raymi in Peru, or any of the various different Christmas traditions, people come together to jubilate and fight off the cold. 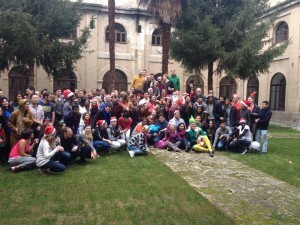 On Sunday, three IMBA intakes came together in the Segovia campus to celebrate their own festive winter event: the first annual “IE Winter Games“. Everyone put to good use the skills they have been practicing all year, through activities such as bobbing for winter apples, holiday golf, and snowballs-and-chopsticks, to name a few. 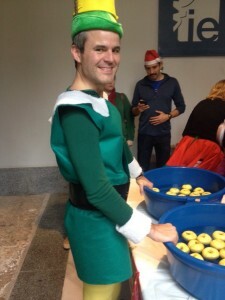 A team of elves moonlighted during these last weeks to put together the event, which also raised money for a local Madrid charity. Along with two other charities, this money will be the outgoing November intake’s gift back to the Madrid community that has given them so much over this amazing year. The grand prize of the Winter Games went to a graduating team of festive holiday revelers who called themselves “Mistletoe” and who ceremoniously handed over the event’s official mascot, “Bets IE the Christmas Cow” to the new November intake. All other teams have said that they’ll begin training again after a short holiday break to recover from the physically demanding event. And all are looking forward to next year’s IE Winter Games! To see more click here to see the video of the current student Yulia Zhuchenkova (IMBA Nov. 2014).